There are some questions in the interview, which you know very well, but are not sure how to frame it properly. When you are asked about yourself, then it is definitely something that you know very well, but if you talk too much about your capabilities, then it might seem like you are bragging about it and if you don’t talk about it much, then the interviewer will assume that you do not possess any such quality. There is a very thin line to walk on when you are answering this question i.e “tell us something that is not on your resume“. You have to display your skills in a way which will emphasize more on your talent rather than boasting about something. You have to practice your answer well because we all know that this question is sure to arrive at one point of the interview. Either you will have to face two to three interviews to master the art of projecting your skills in the right manner or you can practice it in front of the mirror. The second option is viable because in this economy you cannot risk two to three job offers to master the art of answering questions. When you are asked “tell us something that is not on your resume”, then the first thing that comes to your mind is – now what else do you want to hear from me? All the relevant information is spread out in front of you and the things that are not mentioned there are the ones that can get me rejected straight away. You surely don’t want them to know that I am always late or I talk too much, almost to the extent which can drive you crazy or some other personal stuff! You might want to yell out this type of answer to your interviewer, but you also know that no matter how much you would like to answer them in this manner, at the end of the day you can’t. You have to come up with something that is decent and will help you in portraying yourself in the right light. You cannot say that you are always on social networking sites, either tweeting or updating images on Facebook or writing comments. You cannot even say that you are good at sitting idle and doing nothing, in fact, watching TV all throughout the day is one of the things that you do best when you are not looking for jobs or appearing for an interview. So, the things that cross your mind first when you hear that question are the things you must never ever say during the interview. Instead, just read on to know more about things that will convince the interviewer that there are several other interesting things about you except what is written in there. Here is something that you can say to your interviewer when he or she asks you to share your untold stories. Humour will never go out of fashion and if you can make your interviewer laugh at your expense then nothing can get better than that. This means that you are on the right track. You can share some memorable experience or something amusing about yourself. You might have achieved something in your school, college or in your previous workplace and it would make for a perfect answer to this question. You can share your experience, where you were the only girl participating in an article writing competition and you won the first prize beating all the boys of your college. You can also share the experience of helping one of your teammates in accomplishing the task which seemed almost impossible to everybody, but you both made it possible and helped retain the customer as well. If you have photography as your hobby, then you can share some memorable experiences that you had while shooting one of the perfect pictures of your life. In case, you were a good athlete, then you can share your achievements with your interviewer. Even volunteer activities will count for this answer. If you have a goal set for yourself that you want to achieve within a specified period of time, and then you can share it with the interviewer. But remember that you must not come up with something which doesn’t match the values or mission of the company, where you have come for the interview. Instead, if you see that your goals will actually help the company grow bigger and better, then it is definitely one of the best ways to answer the question. When you appear in an interview, the company likes to find out what the candidate has to offer to the company and how they can add value to the company, so if you have a goal set for yourself, then share it with them just to make them aware that you are thinking about the company’s growth along with your individual growth. We all get motivated by looking at someone who is doing well or who has made a mark in their life. If you have someone in life that inspires you all the time, then you can share it with the interviewer, when he or she asks you this question. Motivation is the strength that allows you to keep going when everything is out of order, so if you have a source of inspiration or motivations, then do share it. You never know you might get someone else motivated as well. If there is some social cause that you really feel for, then it will make for a perfect answer to the question. Don’t just make up your answer; instead, come up with honest feelings about the issue. When you are sharing your views and preferences about something wrong that is going around you, then it will show that you are aware of your surroundings and is also concerned about the well being of others as well. If a certain incident has forced you to change your career path and that is the reason you have opted for this field, then you can share this interesting story during your interview to make them aware of your struggle and also your determination to succeed. You can sum up interesting facts about your career in a few lines and present them in a way which will highlight your strengths. The timing of the question is important, if this question is asked at the very beginning of the interview, then the interviewer is trying to know more about you. 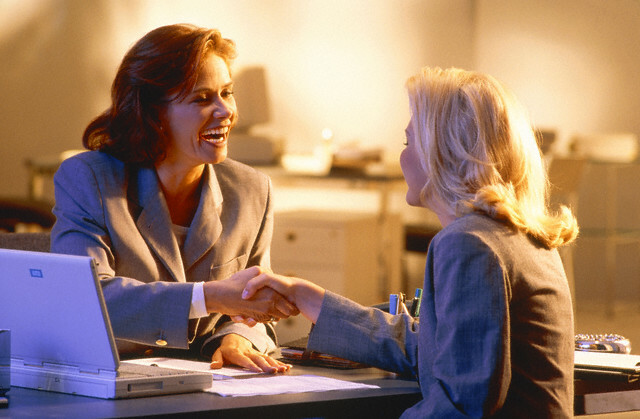 It is used as an ice breaker by some of the interviewers. If you are not sure about what they are looking for through this type of question, then you can clarify it with them. When the interviewer asks this question while reviewing your resume, then it means that he or she wants to know more about your professional life. So, you can start in the chronological order and also add in some interesting details about your work. You can also add in the reason what prompted you to leave your earlier job and apply for this one. She already knows what position you worked for by going through your resume, therefore you need to let them know how you interact with your co-workers or how you work under difficult situations. Sometimes it is hard to stop talking about the job responsibilities you have handled and all your achievements. If you are going on and on, then it is a good idea to keep checking with the interviewer when you see him getting bored, you can just cut it short and a pinch of humor for making it a long one. If you have been working in a team and were the one who was responsible for managing the team, then you will definitely have experiences where you had to go all out of your way to solve the matter. 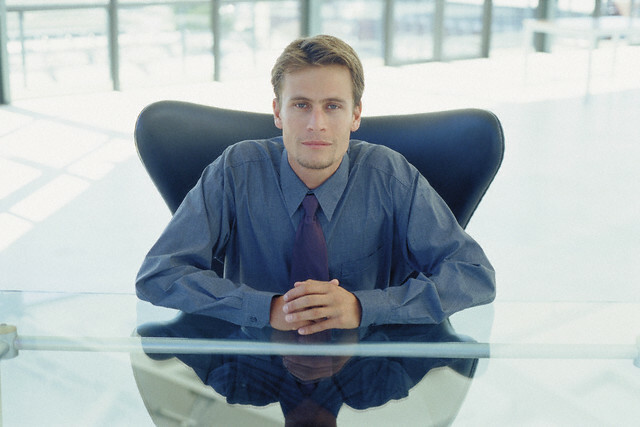 Here you can portray your leadership skills and how good you are with your team. When you are managing a team there are several hurdles that you have to face on a daily basis, you can share some of them and the process that was implemented to get over the issue. It will show how capable you are in handling a big team. The interviewer wants to know whether you have any life other than your professional life. Any special interest will surely make for an interesting story to tell your interviewer so that he knows another aspect of your personality. Hiring managers not only look for candidates who have good technical knowledge but also wish to hire employees who have some extra skills. Selecting such employees will help the team and the organization in a better way. For this sake, employers try to ask different type of interview questions like behavioral questions, conditional questions etc or ask candidates things which they have not mentioned in the resume. Most of the candidates fine-tune their resumes as per the job description for which they are applying. In such a case employers find it tough to assess the candidate as per their requirement. So you need to prepare well and practice all types of trick questions that can be asked by an interviewer. You can easily find many of them on the internet. Well, “Tell me something that is not in your resume“, is one such question which is asked by the employer to the candidate. 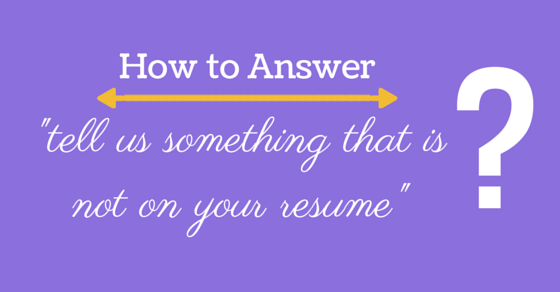 So here are a few steps that you need to follow while answering this interview question. What Not to Say in Response? Though this question is a little bit tricky, as a candidate you need to be handle it very well. Answering this interview question in an effective way will lead you impressing your interviewer easily and cracking down the interview. So mentioned here are fa ew things that you are not supposed to say or do while answering this question.